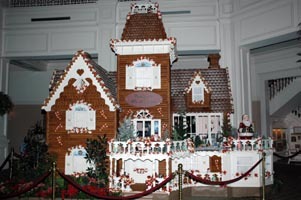 Contemporary and Grand Floridian Resort Gingerbread Displays, Osborne Lights at Disney's Hollywood Studios, Holiday Treat 09 DVD Preview! 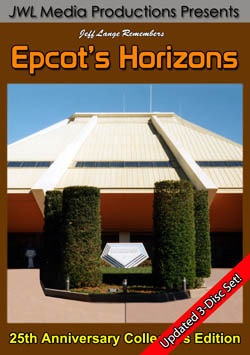 Continue reading Contemporary and Grand Floridian Resort Gingerbread Displays, Osborne Lights at Disney's Hollywood Studios, Holiday Treat 09 DVD Preview! 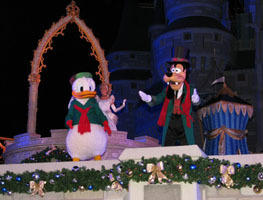 As promised, I am featuring some photos from the 2008 Mickey’s Very Merry Christmas Party at Walt Disney World. 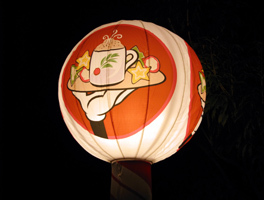 Below is the newly decked-out for Christmas train station and Holiday Treats balloon! 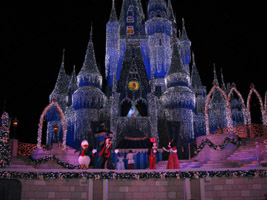 Next we experience Cinderella’s Castle transformed into a sparkling, glistening Ice Castle during “Cinderella’s Holiday Wish”. 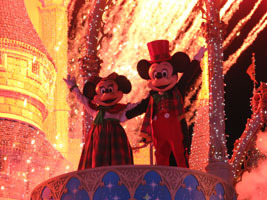 Main Street is never so festive as it is during “Mickey’s Once Upon a Christmastime Parade” below! 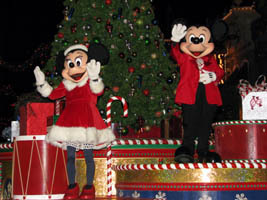 Mickey and Minnie are the grand marshals of this Magic Kingdom holiday classic! 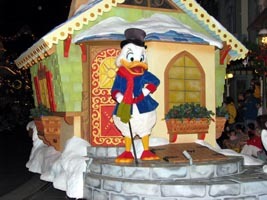 Scrooge McDuck even makes an appearance! 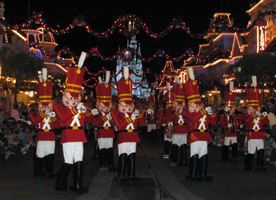 The Parade also features one of my all-time favorites, the Toy Soldiers from Babes in Toyland! 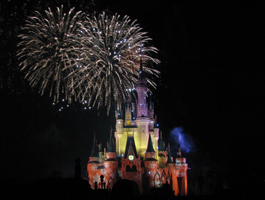 The festivities continue with “Holiday Wishes – Celebrate the Spirit of the Season”, now enhanced by the Castle Dream Lights! 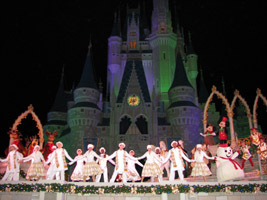 Next is the “Celebrate the Season” show, featuring Christmas favorites in a dazzling, singing and dancing extravaganza! 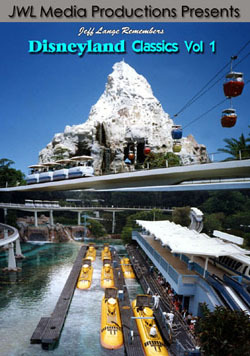 To see the more of the 2008 Mickey’s Very Merry Christmas Party, please visit partner site MouseSteps! 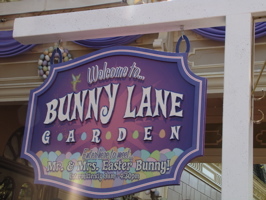 Jeff Lange’s Holiday Treat 08 (Mickey’s Very Merry Christmas Party 2008). 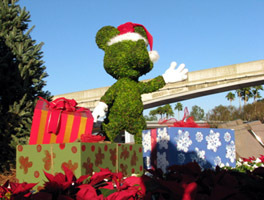 This all-new JeffLangeDVD title features the 2008 Mickey’s Very Merry Christmas Party including: Cinderella’s Holiday Wish, Mickey’s Once Upon A Christmastime Parade, Holiday Wishes – Celebrate the Spirit of the Season, the “Celebrate the Season” show, cookie and hot chocolate stations and much more! 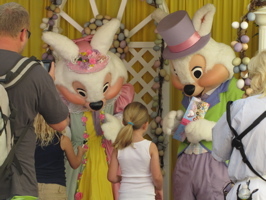 Denise from MouseSteps shot this video recently (as well some Grand Floridian Christmas tree videos HERE), and she also has many photos on her recent update! 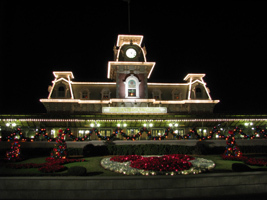 Walt Disney World Christmas Decorations 2008 – A Further Look! 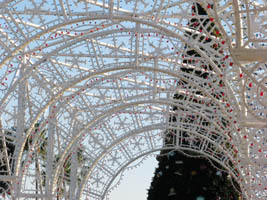 While in Florida last week I had a chance to see the the beginnings of the Walt Disney World Christmas decor. 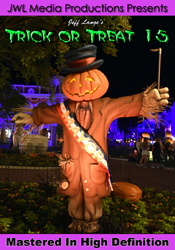 This is much later this year than last, when Disney MGM Studios was fully decorated before Halloween! 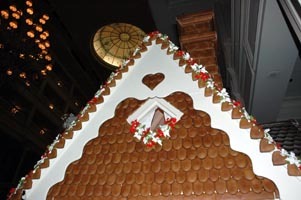 Below is the Grand Floridian Resort’s Gingerbread House (celebrating it’s 10th anniversary)! 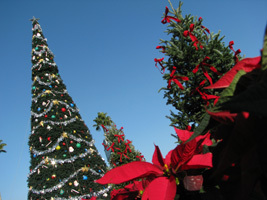 Partner site MouseSteps.com also stopped by Walt Disney World yesterday and got these great photos of the Disney’s Hollywood Studios Christmas tree and poinsettias! 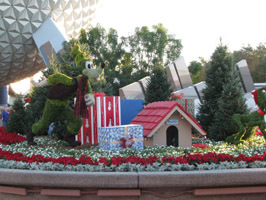 Epcot has also been getting into the holiday spirit, featuring a new Christmas topiary showcasing Mickey and the gang along with many presents! 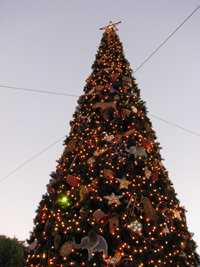 The lights of Winter continue to go up, along with a classic Christmas tree topped with the traditional angel. 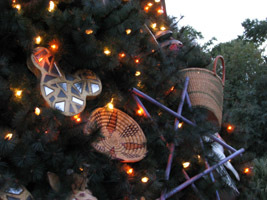 Animal Kingdom has it’s usual animal-themed tree up, and it looks as beautiful and detailed as in previous years! 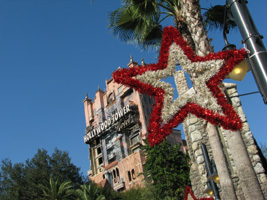 To see the more of the 2008 Holiday Decorations, please visit partner site MouseSteps! Just in time to start thinking about the holidays, we have these title available! 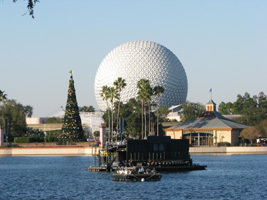 Jeff Lange Remembers: Disneyland Holiday Classics, Jeff Lange Experiences: Epcot’s Holiday Traditions, Jeff Lange Remembers Walt Disney World Holiday Classics, Jeff Lange’s Holiday Treat 06 and Jeff Lange’s Holiday Treat 07. 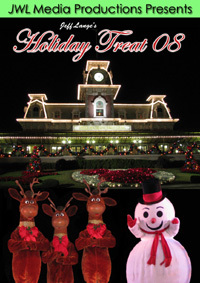 I am also in the process of editing my Holiday Treat 08 DVD featuring this years Mickey’s Very Merry Christmas Party! 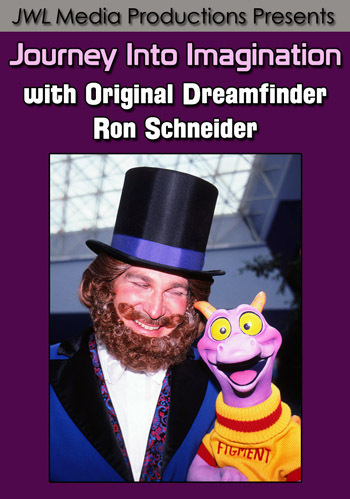 Look for a release around Thanksgiving.